In the 18th arrondissement of Paris, the PataKrep creperie welcomes you in a relaxed and colorful setting. You will come back a few years back to the sight of the furniture. Tables and chairs seem to come straight from a school. And the menu is written on a draft notebook. Let's start reading. 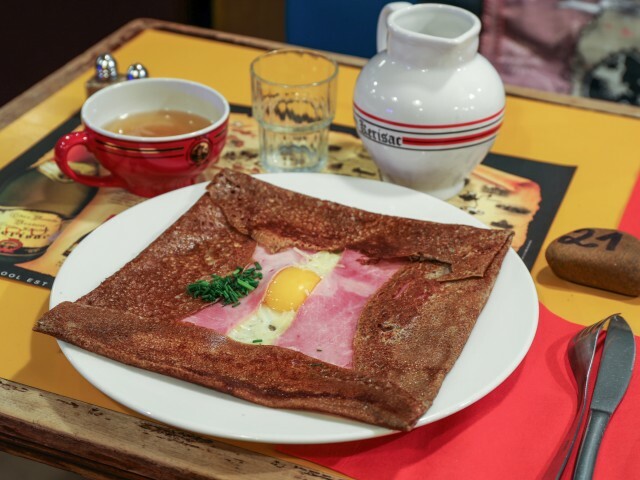 Why not start with a delicious galette Madame? And for dessert, you will enjoy the Norman crepe. The Chef will prepare delicious pancakes and cakes, sweet or savory. You will only have to choose and to taste. For an aperitif with friends do not hesitate to come for a drink accompanied by a sausage, a plate of pork, cheese, sardine oil, to share ... or not! In fine weather, you can sit on the terrace and enjoy the weather. An ideal address for a gourmet break.